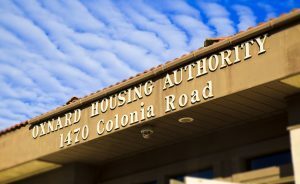 The Section 8 tenant-based Housing Choice Voucher (HCV) assistance program is funded by the federal government and administered by the Housing Authority of the City of Oxnard (OHA) for the jurisdiction of the City of Oxnard in the County of Ventura, CA. When a family is determined to be eligible for the program and funding is available, the OHA issues the family a housing voucher. When the family finds a suitable housing unit, the OHA will enter into a contract with the owner and the family will enter into a lease with the owner. Each party makes their respective payment to the owner so that the owner receives full rent. The voucher holder pays 30%-40% of their household income toward rent and the Housing Authority will pay the difference directly to the property owner each month. Even though the family is determined to be eligible for the program, the owner has the responsibility of approving the family as a suitable renter. The OHA continues to make payments to the owner as long as the family is eligible and the housing unit continues to qualify under the program.